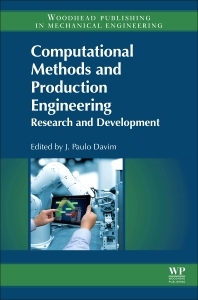 Computational Methods and Production Engineering: Research and Development is an original book publishing refereed, high quality articles with a special emphasis on research and development in production engineering and production organization for modern industry. Innovation and the relationship between computational methods and production engineering are presented. Contents include: Finite Element method (FEM) modeling/simulation; Artificial neural networks (ANNs); Genetic algorithms; Evolutionary computation; Fuzzy logic; neuro-fuzzy systems; Particle swarm optimization (PSO); Tabu search and simulation annealing; and optimization techniques for complex systems. As computational methods currently have several applications, including modeling manufacturing processes, monitoring and control, parameters optimization and computer-aided process planning, this book is an ideal resource for practitioners.